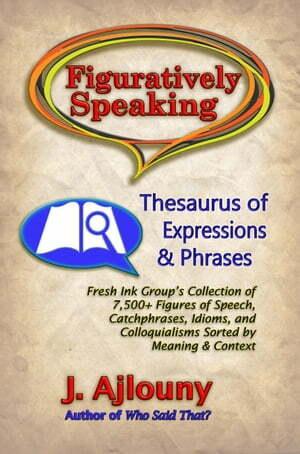 Collins Booksellers - Figuratively Speaking: Thesaurus of Expressions &Phrases by J. Ajlouny, 9781936442720. Buy this book online. A figure of speech is an expression in which the words are used, but not in their literal sense, to create a more forceful or dramatic meaning. They are often in the form of metaphors, similes and hyperbole. “A fountain of knowledge,” is a good example. “Stretching the truth,” is another. Whether reading it for fun, researching phrases you use, or studying the symbolic foundations of our language, Figuratively Speaking is the resource you’ll reach for time and again.